सर्दियों में तिल, गुड़ और सूखे मेवे से बने बर्फी या लड्डू बनाये. 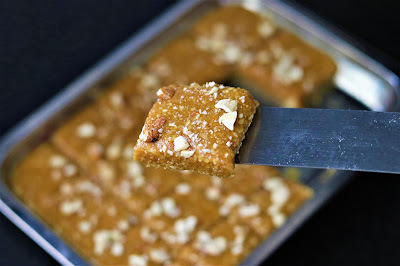 Til gur barfi with jaggery is a healthy dessert recipe and easy method to prepare home made sweets. This tilkut barfi is usually prepared during winters especially on Lohri, Makar Sakranti, and fast like सकट चौथ or sakat chauth. 1. Dry roast sesame seeds or til on low flame till the seeds puff up and turns little brown. Remove the roasted seeds in a plate. 2. Dry roast khoya or mava till soft, very little brown and the taste is not raw. Remove roasted khoya in another plate. 3. Melt desi ghee in same pan. Then melt jaggery, add 2-3 tsp water. Boil jaggery till it forms syrup. Cook till the syrup starts to bubble. Drop few drops of syrup in water, if it does not spread, that means jaggery syrup is ready. 4. At this stage add in khoya , mix it well. Then add roasted sesame seeds and combine everything well till it becomes solid mass. 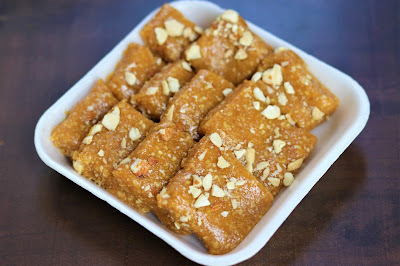 Ensure to keep the flame on lowest side and cook till mixture becomes dense to set barfi. 5. 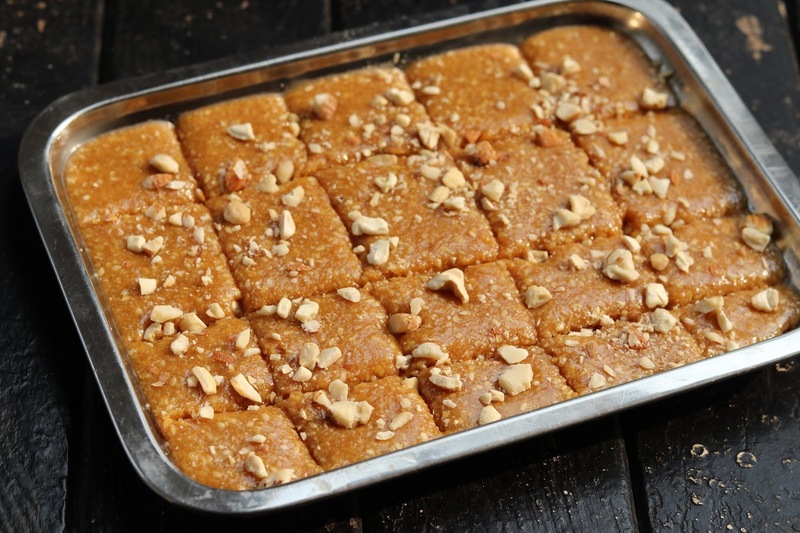 Set barfi in a greased plate and allow to set for 3-4 hours or until firm. Cut in to desired shape and store in airtight container.